Biology Ectoparasitoids of fly pupa (Diptera) or hyperparasitoids of Hymenoptera. Worldwide: 323 species in 12 genera. Afrotropical region: 27 species in 5 genera. Dessart P. 1987. Revision des Lagynodinae (Hymenoptera Ceraphronoidea Megaspilidae). Bulletin de l’Institut Royal des Sciences Naturelles de Belgique 57: 5–30. Dessart P. & Cancemi P. 1987. Tableau dichotomique des genres de Ceraphronoidea (Hymenoptera) avec commentaries et nouvelles especes. Frustula Entomologica 7-8: 307-372. Johnson, N.F. & Musetti, L. 2004. Catalog of systematic literature of the superfamily Ceraphronoidea (Hymenoptera). Contributions of the American Entomological Institute 33: 1-149. Madl M. 2015. A catalogue of the families Ceraphronidae, Megaspilidae (Ceraphronoidea), Diapriidae (Diaprioidea) and Proctotrupidae (Proctotrupoidea) of the Malagasy subregion (Insecta: Hymenoptera). Linzer Biologische Beitraege 47(1): 621–652. Masner, L. 1993. Superfamily Ceraphronoidea (pp. 566-569). In GOULET, H. & HUBER, J. (eds). Hymenoptera of the World: an identification guide to families. Research Branch, Agriculture Canada, Ottawa, Canada, 668 pp. Masner L. & Dessart P. 1967. La reclassifi cation des categories taxonomiques superieures des Ceraphronoidea (Hymenoptera). Bulletin de l’Institut Royal des Sciences Naturelles de Belgique 43(22): 1–33. Mikó I, Yoder M.J. and Deans AR. 2011. 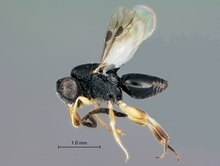 Order Hymenoptera: Family Megaspilidae: Genus Dendrocerus. In: Arthropod Fauna of the UAE. Van Harten, A (ed). Dar Al Ummah, Abu Dhabi.